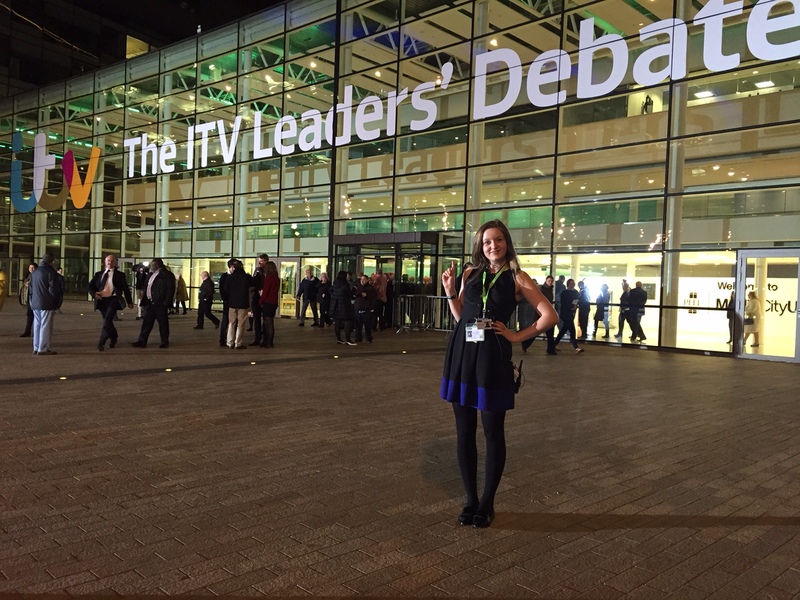 When I heard that ITV were doing the leader’s debate, I wanted in straightaway. After plenty of vocal declarations (‘POLITICS IS DEAD GOOD, YEAH’) in the office, I was told they were looking for some volunteers to look after the leaders and their ‘crew’. Each party was assigned a VIP runner, a leader runner and an entourage runner. I was to look after the Lib Dem entourage (or the Nicky C Massif as I liked to call them) and we all met at 9:30am for their familiarisation session in studio. 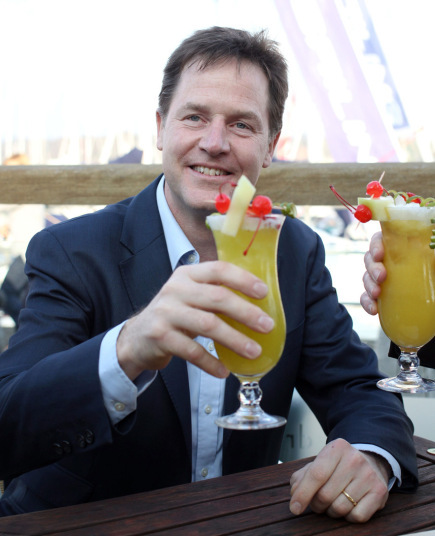 An efficient bunch, they were in and out in their allocated 20 minutes with Mr. Clegg only asking for one item on his rider – bananas. It wasn’t until I saw them in his dressing room that it clicked – YELLOW! Maybe he only eats yellow foods before big public appearances?! Should I get separating some egg yolks? Does quinoa count? Has the Prime Minister’s runner been sent out for a multipack of Blue Ribands? DON’T EAT THE LABOUR CHERRIES, NICK. 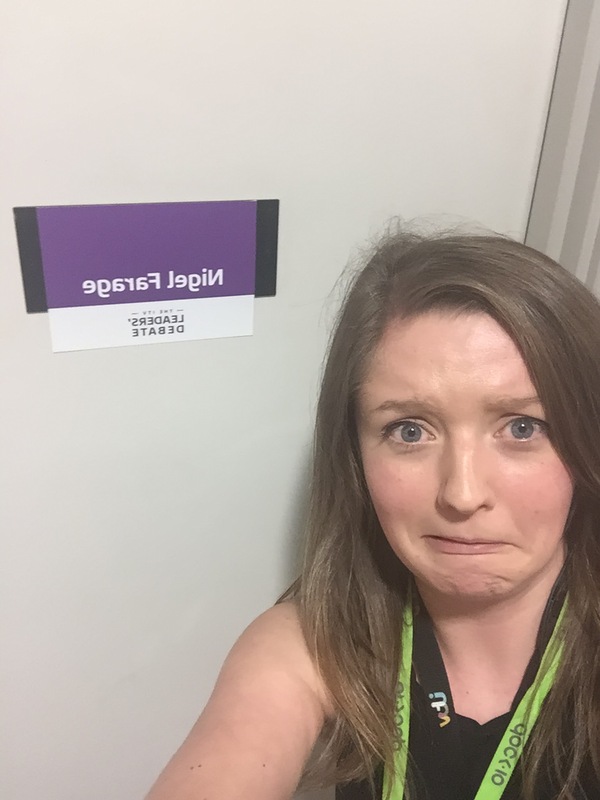 Dietary requirements aside, the rest of the day was spent helping out the production team and trying to sort out the air conditioning which was threatening to turn the Green’s dressing room into a Bikram Yoga studio. Nick Clegg arrived back at the studio at 6:45pm to a blaze of press cameras – it was starting to get exciting. As make up attended to all the leaders, the corridor outside their dressing rooms was lined with suited security, their lapels each brandishing a fancy brooch. I thought this was very ‘on trend’ until I found out it meant that they were all holding firearms. Ah. Right. Cup of tea anyone? Whimper. At 7:40pm, the call came. The doors opened one by one like the most impressive domino show you’ve ever seen. Now, I’ve worked with a lot of celebrities and have never been affected by their presence but watching some of the most powerful people in our country stride past was really surreal. I stayed behind to look after Clegg’s entourage, who left soon after to go to the media centre to ‘spin’ – disappointingly this is not a huge game of dizzy dinosaurs but where a collection of party members and journalists were, ready to ‘spin’ stories from the debate to splatter across the headlines the next day. Archive image of Cleggert going for a ‘spin’. 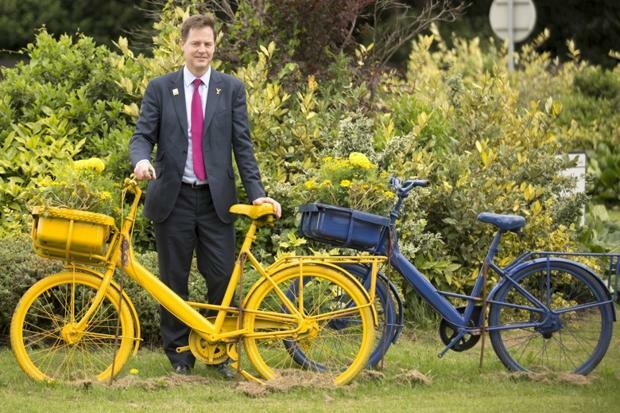 Liking the yellow bike, Nick. YOU’RE SO ON BRAND. I was fortunate enough to catch most of the debate from the hospitality suite and was really proud of all the hard work my colleagues had put into pulling off such a polished show. Hecklers aside (which I secretly loved), it felt brilliant to be part of something that would hopefully make more people get out and use their vote. 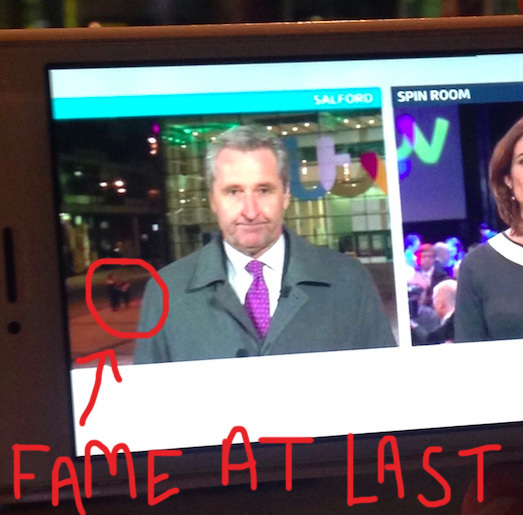 We bid adieu to the deputy prime minister who left straightaway and made our way to the front of the studios where the ITV News at 10 were broadcasting live. I could lie and say we were just eager for more political discourse but in reality, we were just desperately trying to get in the back of shot. Ah, you wouldn’t think we worked in TV, would you? Remember, April 20th is the last day you can register to vote. If you haven’t done it yet, please do so NOW here! It only takes 5 minutes but you will need your National Insurance number. If, like me, you’re a bit confused about who to vote for, I found the Vote For Policies website helpful.